I needed something to put a gift card in for a birthday today, so had some fun creating this little one. 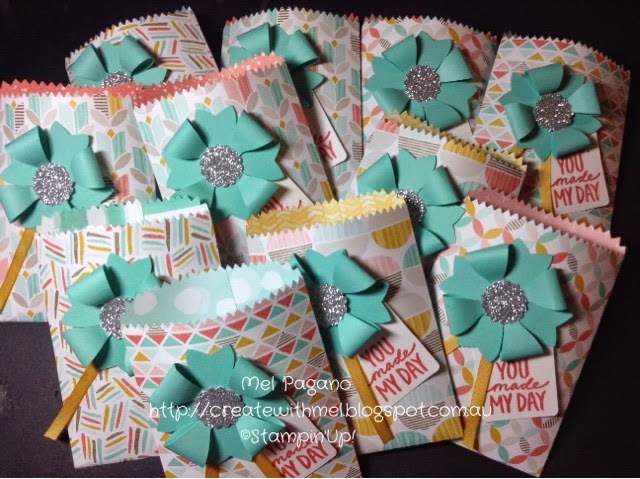 I have used the Mini Treat Bag Framelit – which I LOVE – and a couple of different stamp sets to complete the front. The wonderful new ‘Celebrate Today’ set along with ‘In this Together’ and using colours Bermuda Bay, Daffodil Delight and Strawberry Slush to colour the Irresistably Yours Paper in the background. Top it off with a bit of bling from our Bermuda Bay sequin trim and you’re done! I also used the Mini Treat Bag Framelits to hold gifts for my ladies attending class last week. They loved them!